Prominent & Leading Wholesale Trader from Pune, we offer swimming pool ladder. 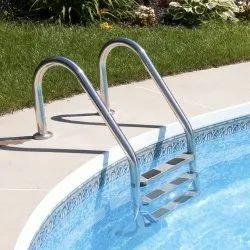 As a renowned company, we offer an excellent quality range of Swimming Pool Ladders, which are made from superior quality of stainless steels. These products are available in various specifications as per client requirement in terms of shapes, sizes and colors and we offer these products for facilitating a swimmer to moving easily in and out of the water. In addition, these products are located beside the walls of the pools and are easily available in the market. Looking for Swimming Pool Ladder ?